Members of The Indigenous Land Defence Across Borders project have returned from our first solidarity exchange with the Indigenous people of Palestine. A delegation of seven – cis and two spirit – women (five Indigenous, one Palestinian and one ally) visited villages and cities in occupied Palestine from July 9th – 16th. Our guides, members of the Stop The Wall campaign and other activists based in Haifa, accompanied us on visits to villages and cities throughout the country. We witnessed the harsh cruelty of Israeli apartheid as well as the perseverance of Palestinians living under varying degrees of occupation since 1948 and resisting ethnic cleansing and genocide, and were profoundly inspired by their courage and clear-sighted commitment to their lands and people. Despite the overly-militarized wall that snakes through the West Bank and a system of segregated roads making travel difficult and lengthy so that getting around in every day life is challenging for Palestinians needing to travel and cross check points in order to access employment in so-called Israel, we were profoundly impacted by the stories of resistance we heard in places like Al Aqaba, a village that is working hard for its self-sufficiency and economic independence by way of producing zatar and teas as well as creating its own dairy production facility. 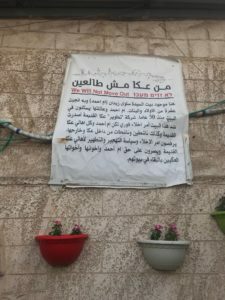 We had the opportunity to visit Khan Al Amar, a Bedouin village slated for destruction close to Jerusalem on the day that hundreds of Bedouins had converged to express their solidarity with its inhabitants. Other highlights of our trip included a visit to the coastal city of Akka where we met Um Al Ahmed and heard of her successful stand against displacement from her home in the old city. Her family’s eviction along with an entire block of residents following the transfer of her property to a hotel developer was prevented by the presence of community members who in addition to other activities opened a mosque next door (the first to be successfully established in these territories since 1948) conducted meetings and cultural events for weeks culminating into a 5000 strong demonstration so that for the time being the eviction has been halted. We thank everyone who generously supported the delegation and look forward to providing a more complete report back at a public event to be held in the coming months. Please follow this page for details for more information about the report back and other next steps towards building solidarity.